This article is an introduction for anyone who wants to learn more about composing music. An introduction must be treated for that it is: a beginner’s course; therefore, do not expect to learn all there is about composing. A song usually consists of many things in which harmony, melody and lyrics (if it is not instrumental) are the main components. Harmony in music can be described in many ways. You could call it the mood or atmosphere of the song. A concrete example of harmony in music can be an instrument accompanying a singer. Whatever the ingredients are the harmony is collaborating with the melody. The melody is often the most distinct part of a musical work. It is the melody you often remember from a song and maybe recapitulate afterwards by whistle it. The order in which harmony and melody are created can vary among composers. The art of combining harmony and melody is done with talent, experience and some guidelines. This article cannot offer talent or experience, but it can give you basic guidelines. Two fundamental elements in composing music are scales and chords. When creating a piece of music, the knowledge of scales is indeed helpful. Maybe you are sitting in front of a piano without a clue what keys to press down for making it sound alright? The easiest way to start composing on the piano? Just play exclusively on the white keys! Doing this, you are playing in the key of C Major, and therefore you do not hear any dissonance. You can use the white keys for both harmony and melody. Use your left hand for chords (this site focuses mainly on scales, if you want to discover more about chords use your search engine or visit Pianochord.org), and your right hand for the single notes. Of course, this is a simple approach to composing, but it is a start. When you are composing a song, it is often enough to stay in one or two keys throughout the song. A typical song starts in one key and stays in it, or, changes key somewhere in the song and most often return back to the original key before the end. The verses approximately consist of three to six lines and usually with different lyrics. The choruses tend to use fewer lines and often repeats the same lyrics. Needless to say: the harmony and melody should both change going from verse to chorus. So, you got a melody and need some harmony? There is more than one way to create harmony; two common ways are counterpoints or chords. We are taking the easiest route and choose chords. Once again, there is more than one way to add chords to a melody. Since this is only an introduction in music composition we are satisfied with two rules: 1) add chords in which the second or third note is the same as the melody note; 2) don’t add chords to every melody note, one or two in every bar are often advisable. Concerning the motion: the harmony can be parallel or contrary to the melody line. To think about the motion in this way can be helpful. Many songs include only three chords, and they are often the tonic, the subdominant and the dominant (see Theory - Scale Degrees for further information). The dominant chord has normally a minor seventh and it resolves well into the tonic. An example could look like C - F - G7 - C.
When you reach the end of the song, a common method is to shorten the interval between chords. This accomplishes a breaking effect. The name often used for a chord sequence at the end of a phrase or song is cadence. One example of a cadence in C Major: C - G - F - C. A cadence in A Minor could be: Am - Dm - E7 - Am. When composing music, it serves you to have a visualization of the relationship between chords and scales. 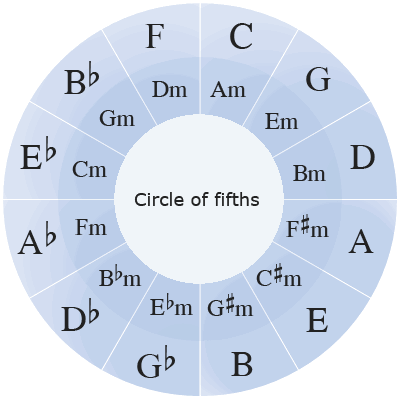 A common visual way to present this is by the Circle of fifths. It is called so because every note is a perfect fifth away from the next. A composer knows, for example, that a D7 chord resolves into G, a G7 chord resolves to C.
The circle also shows the relative keys (major and minor). A Minor is, for example, relative to C Major. That means that you can play the same notes in A Minor as in C Major, but starting from the note of A (or expressed a little differently, use the A note as the tonic center). By doing so you get a somewhat melancholy sound. Compare major and minor scales and you will notice the contrasts and relationships.